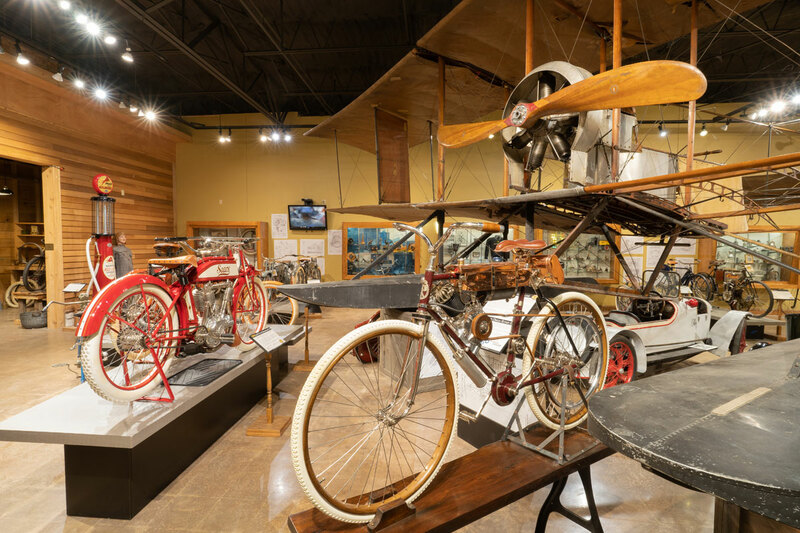 Showcases to the left hold memorabilia, blueprints and casting patterns for the 1914 Steco Cycle Car. 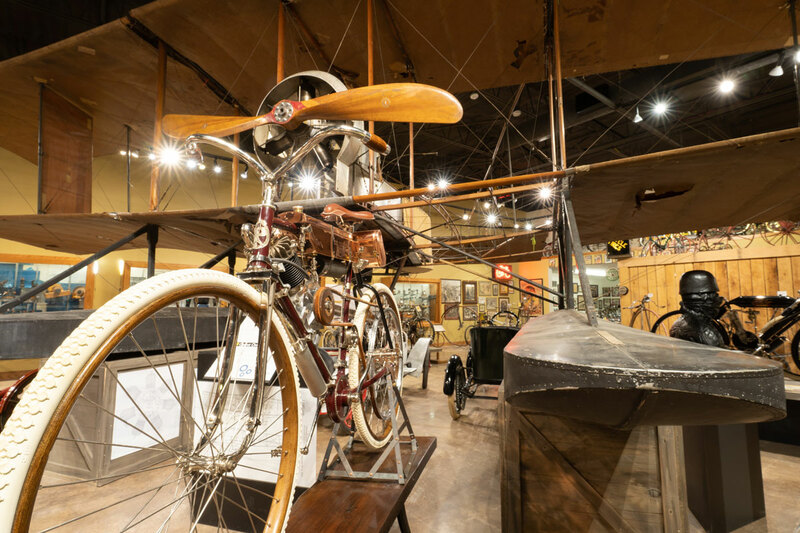 Rotary engine 42 foot wingspan STECO Aerohydroplane fills the hall also containing lesser known pre-1915 motorcycles. 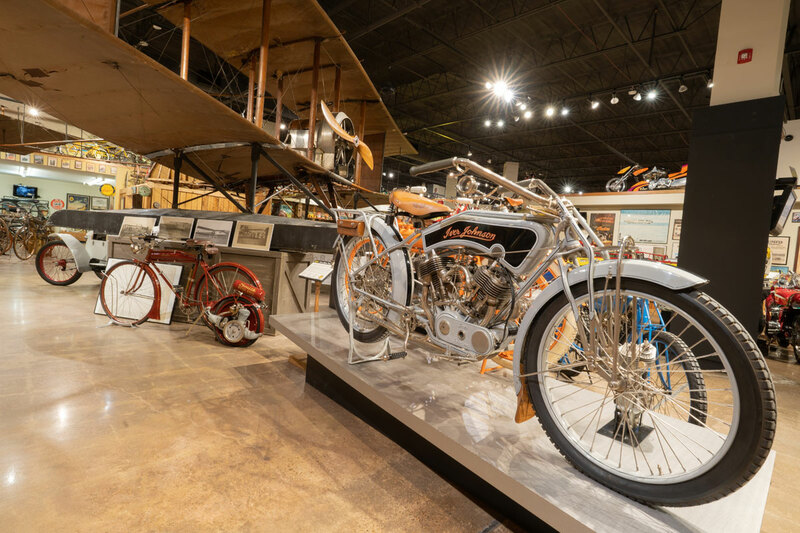 Whether it was 100 years ago or yesterday, one of the cool things about motorcycles is new ideas designers and engineers come up with. 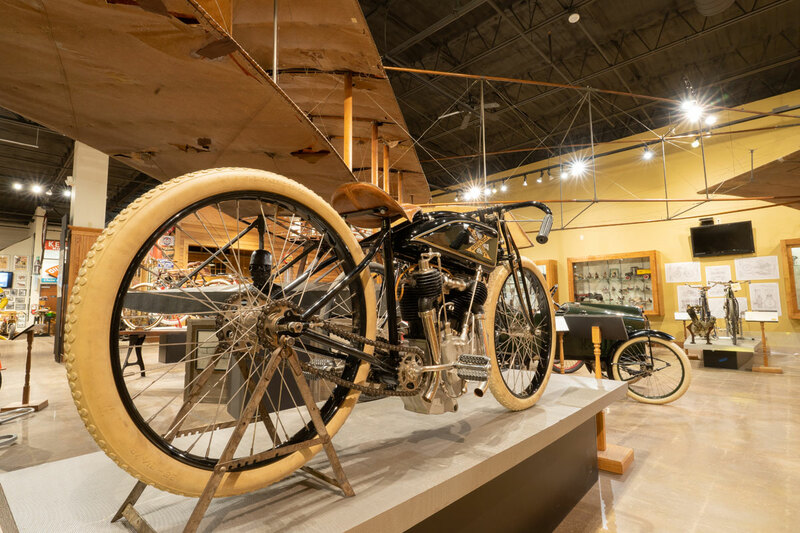 The word INNOVATION, from the Latin word “novus” meaning new, shows in motorcycling’s long history and in transportation machines in general. 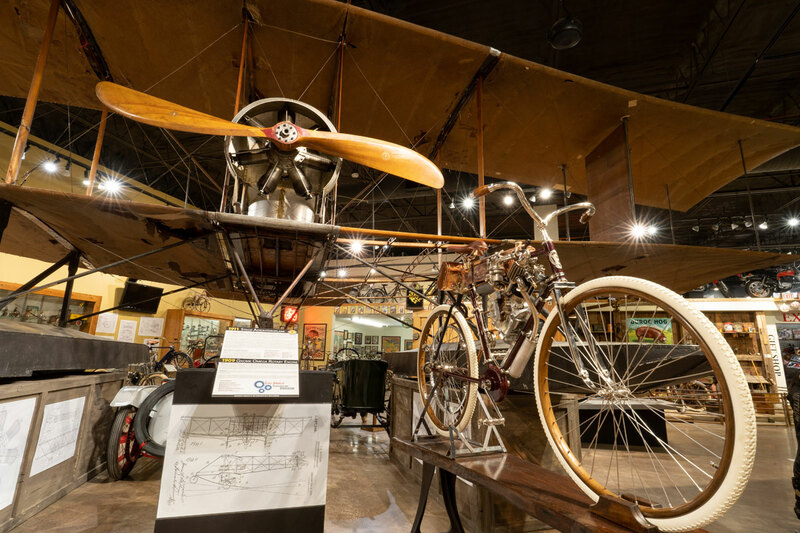 Imagine being about 20 years old in 1900 and watching aviation, automobiles and motorcycles in their design infancy! 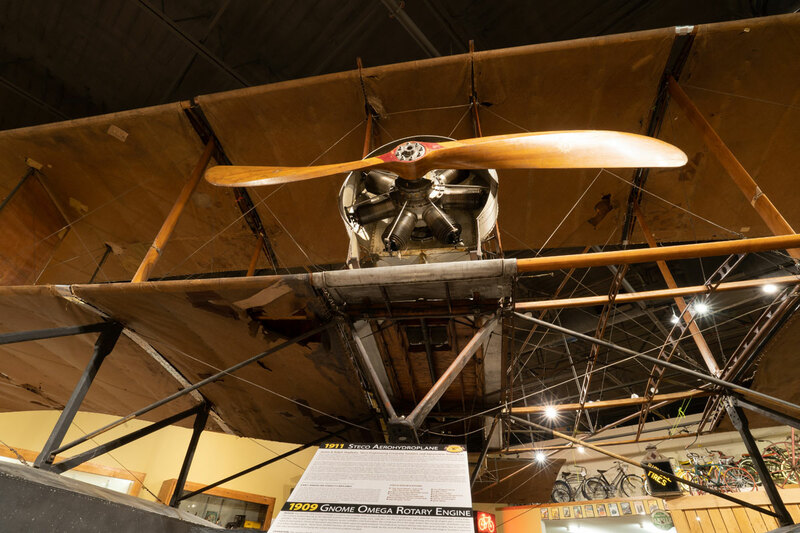 The Wright Brothers had just figured out lift with wing design yet had no real carburetor on their in-line four in 1903. 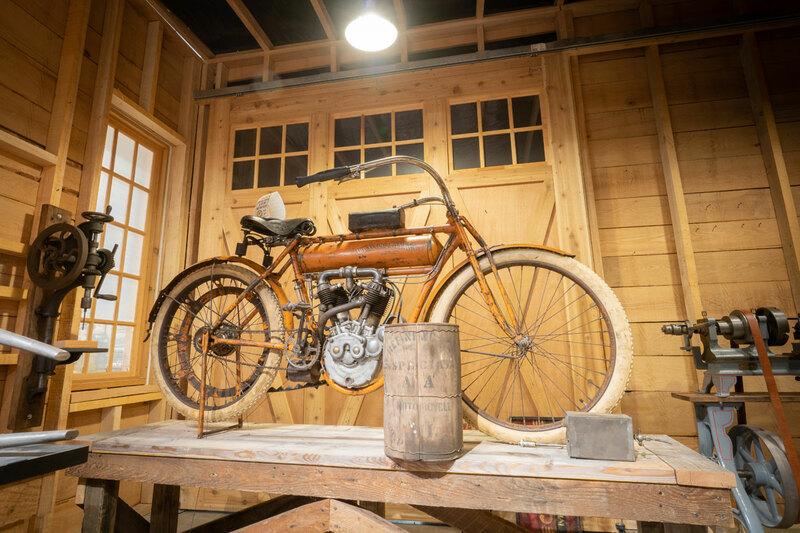 Even earlier in France, De Dion-Bouton was refining an air-cooled single that would later be made in America powering Indians and providing great influence to those designing the first Harley-Davidson singles. 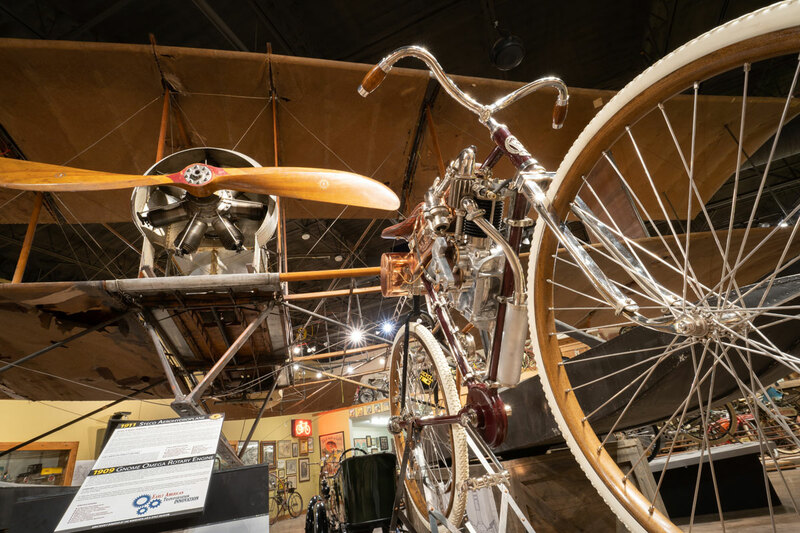 Now we have spar frame bikes with wheelie control, our first motorcycles were little more than diamond frame bicycles with engines and simple belt drive. 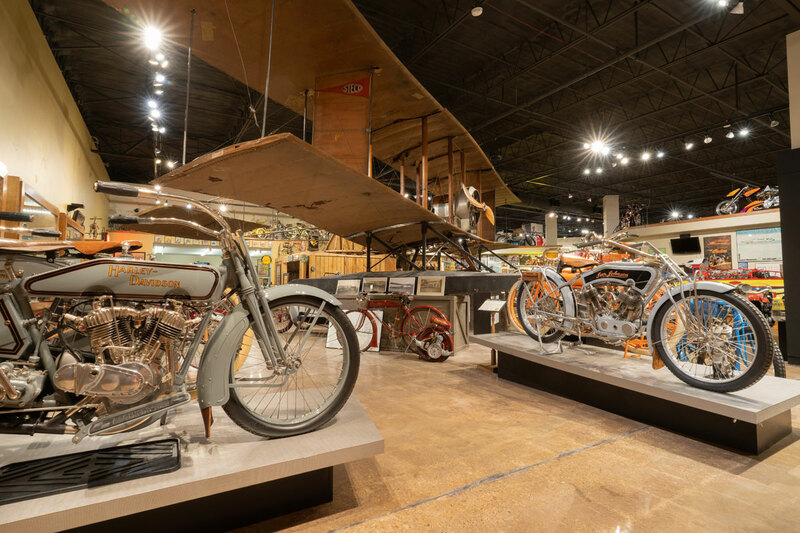 So focusing on innovation, the new exhibition at the National Motorcycle Museum is entitled Early American Transportation INNOVATION. 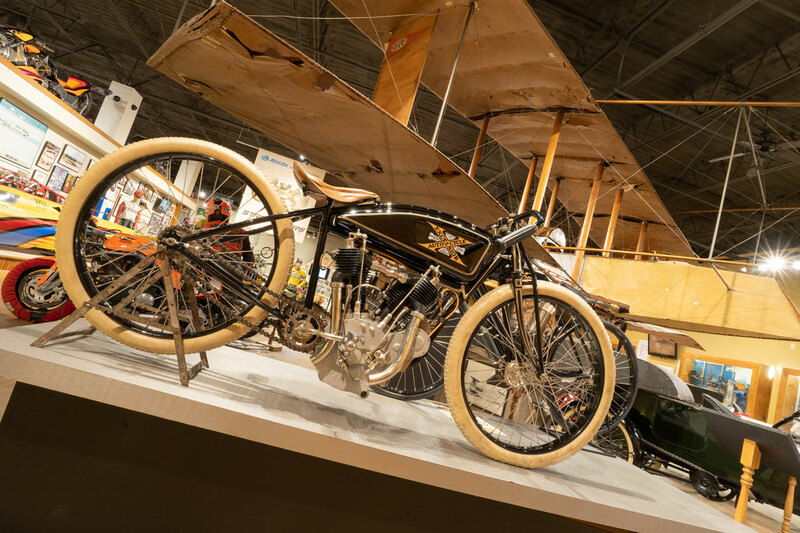 About 15 motorcycles, two cycle cars and a dozen bicycles are on display, and there’s even a 110 year old airplane! Why an airplane, you are asking? 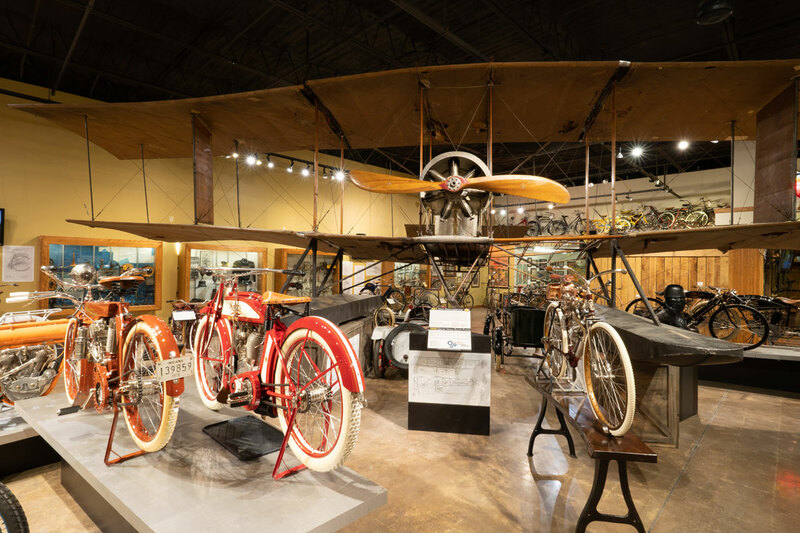 About two years ago we came across something pretty cool, even if it was a bit off course for a motorcycle museum. 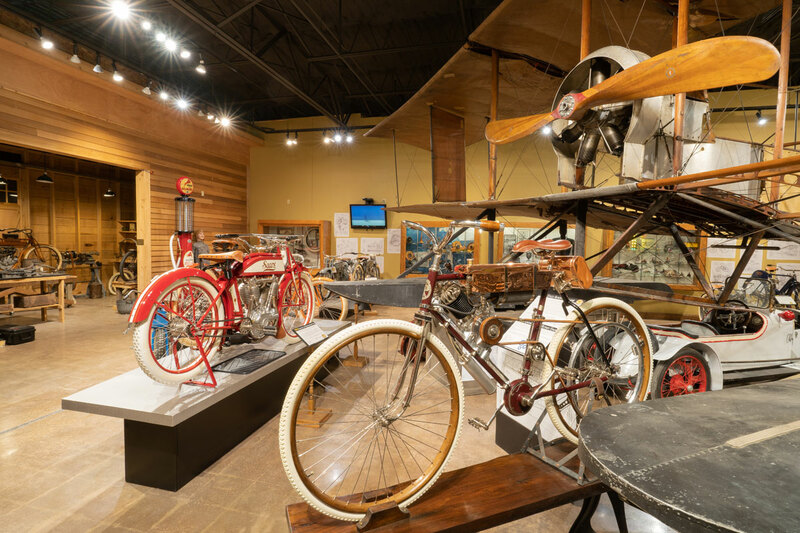 Through a motorcycle collector in Minnesota we got wind of a cycle car and some other stuff that needed a new home. Car, you say? 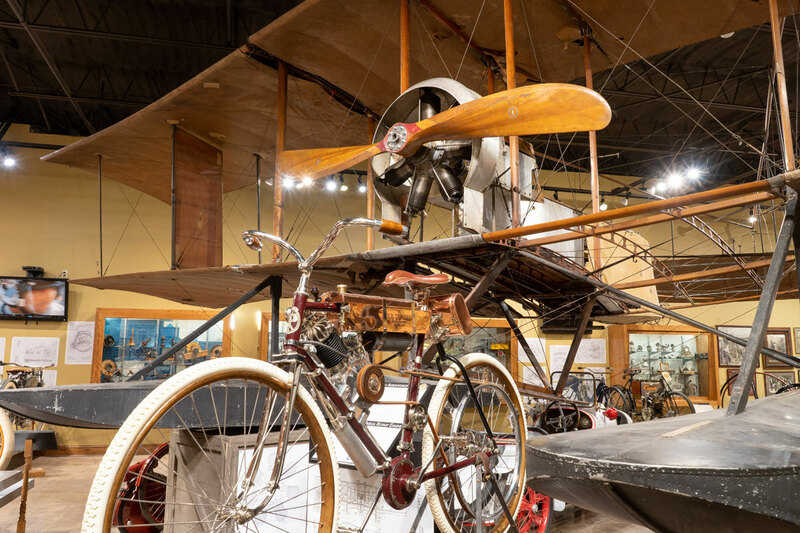 Well, a cycle car is a narrow track, tandem seating four wheeled machine that uses a motorcycle engine, so probably counts as part of the motorcycle family just as three wheelers and sidecars do. 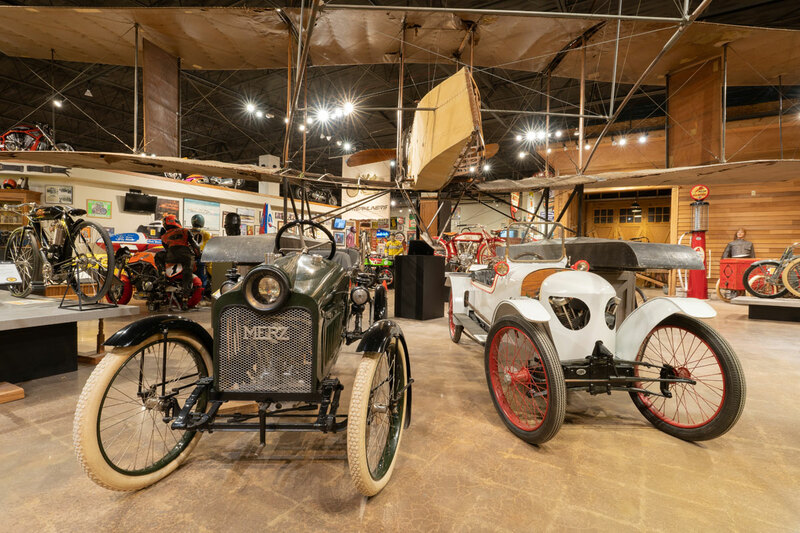 That “picker,” a long time friend of the Museum, got us connected with the people who had the cycle car. 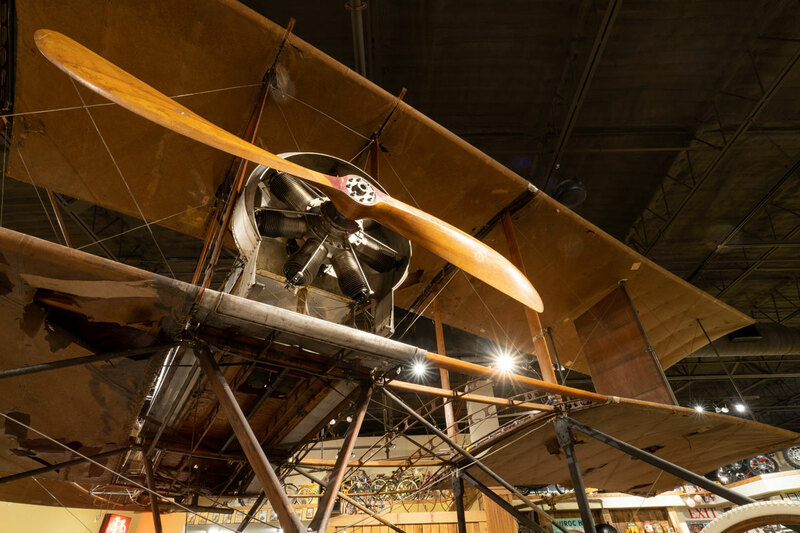 That’s when we learned it was a collection that needed a new home and included was…a seven cylinder Gnome-Omega Rotary engined airplane! 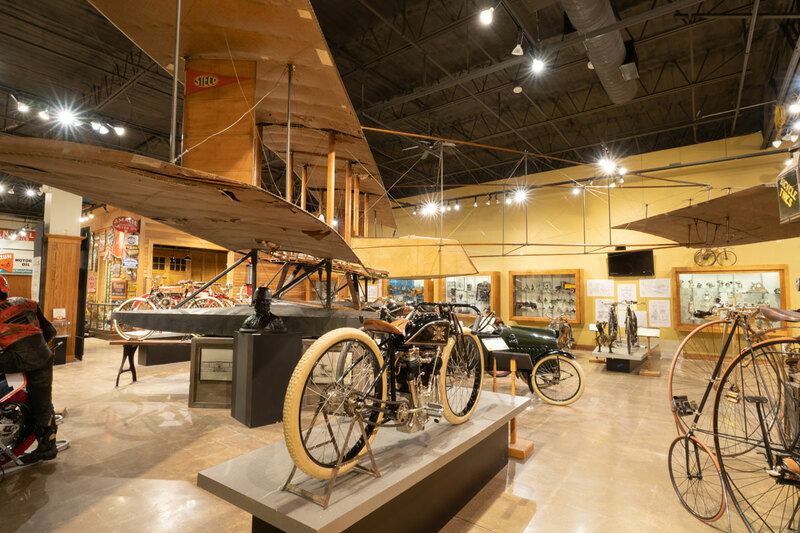 But once John Parham and other Museum staff learned how old, original and cool the airplane was, and that the current caretakers knew a lot about it, considered it the “oldest original condition airplane in America,” we all decided, “go for it.” Through a touch and go chain of events, the National Motorcycle Museum became the home of the STECO collection, creations of Chicagoan, James Stevens. 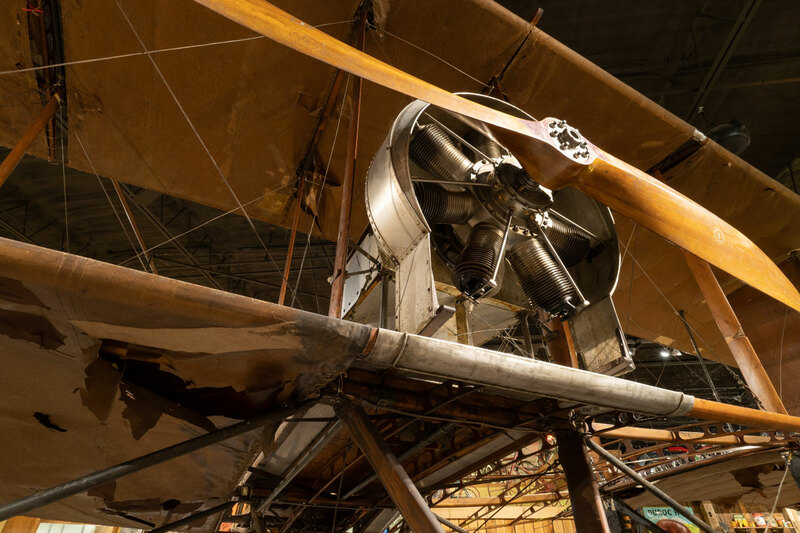 Not only was there the plane and cycle car, but wood casting patterns and a ton of photos and blueprints for these creations from 1910! It took a little time to figure out how to display the airplane. Do we hang it? Put it on its trick pneumatic tricycle landing gear, or on its optional floats, pontoons? It’s up on crates so you can walk all around it, get up close. 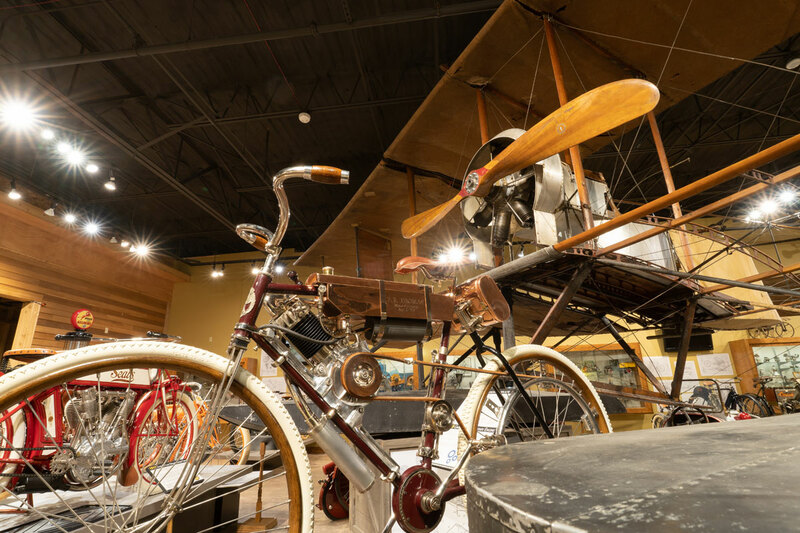 In the new display a few bikes fit beneath the STECO Aerohydroplane’s wings. We thank Bob Chantland for telling us about the Steco collection needing a new home, Denny Eggert, Jon Forman who had cared for the collection many years, those who chipped in through GoFundMe to help with transportation, historic aviation technicians Keith Roof, John Tiffany and Bob Hall for helping us get the plane reassembled in the Museum, all the lenders who offered pre-1920 motorcycles for display and Ric Stewart who helped with the overall exhibition installation. 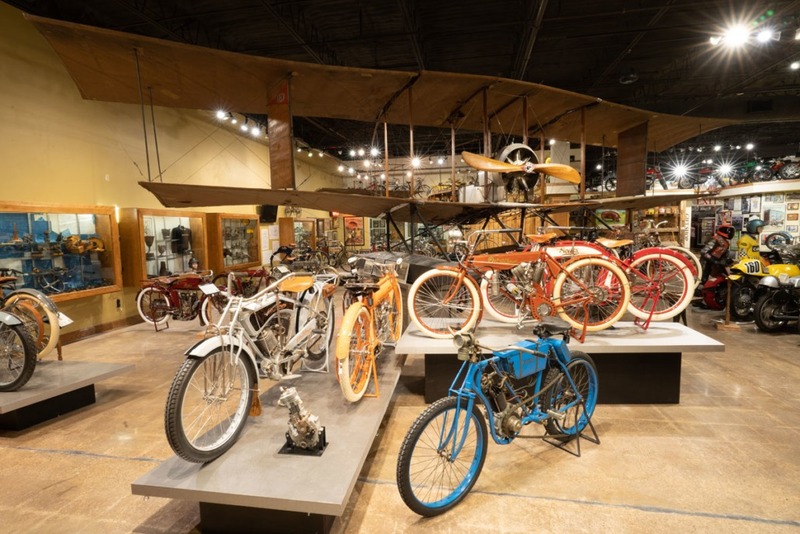 Here are some photos of the new Early American Transportation INNOVATION exhibit, open now. 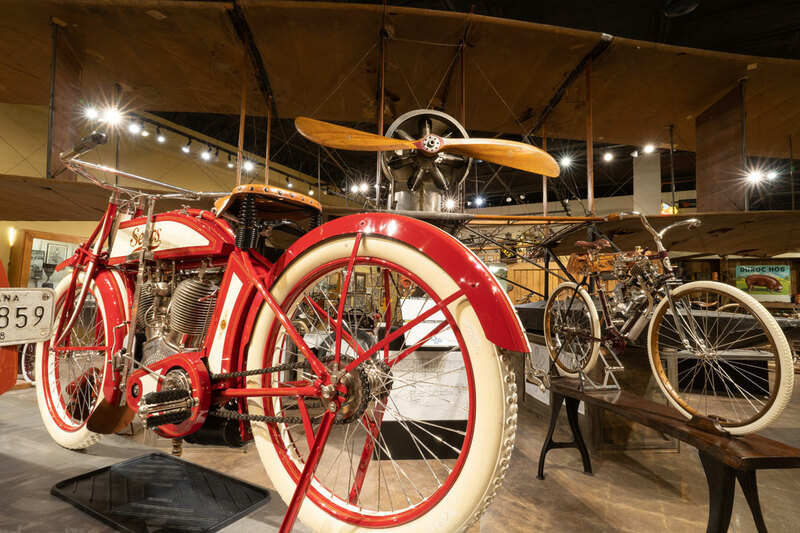 We hope you can stop by and take in all the great motorcycles, the bicycles, cycle cars and the 1911 STECO Aerohydroplane. 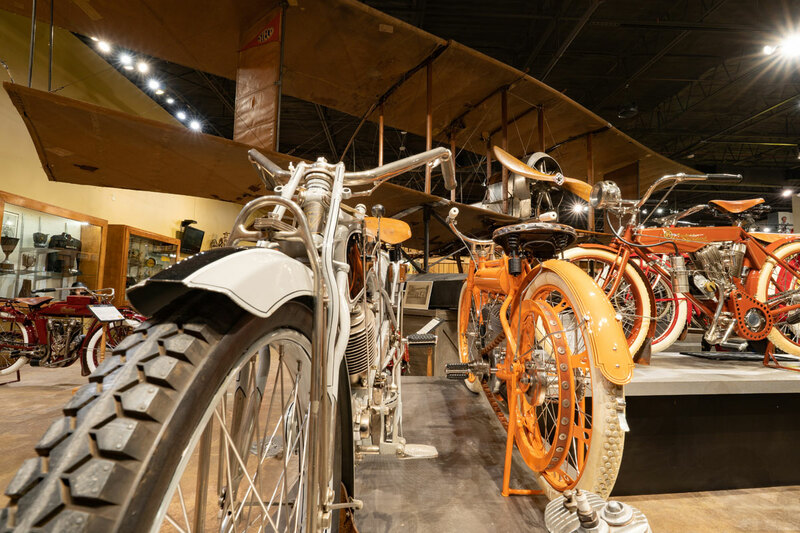 June 29 is the 9th Annual Vintage Rally at the National Motorcycle Museum. 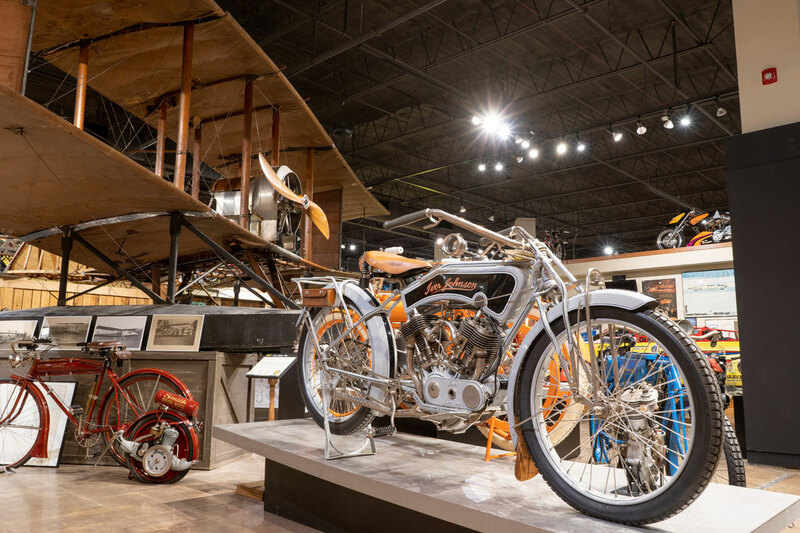 Plan to attend the Vintage Rally and see the new exhibition.